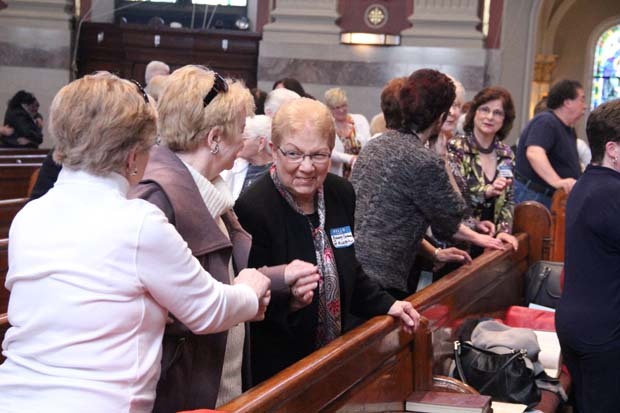 It was a real homecoming celebration for the 60 or so women, many in their retirement years, who visited St. Peter the Apostle Church in Philadelphia on April 25 for a reunion of Bishop Neumann Business School. 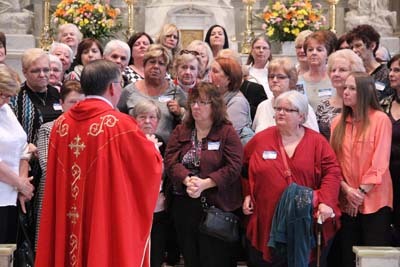 It began with Mass celebrated by St. Peter’s pastor, Redemptorist Father Alfred Bradley, followed by a social in the new atrium adjoining the Shrine of St. John Neumann. 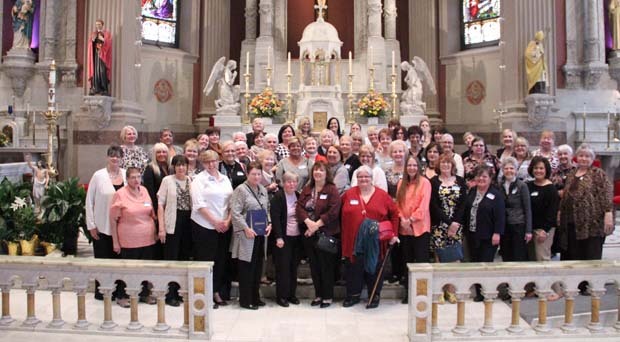 The women who attended represent a virtually forgotten part of Philadelphia Catholic educational history. Bishop Neumann Business School (which had no connection to South Philadelphia’s Bishop Neumann High School) was founded in 1901 originally as St. Peter’s Business School. After educating generations of young women it closed in 1977, and was largely forgotten except through the memory of graduates. Redemptorist Father Matt Callman, who is a parochial vicar at St. Peter’s, came across an alumnae website for the school and called it to the attention of St. Peter’s Advancement Director Sister of the Blessed Sacrament Virginia Milner, who with the permission of Father Bradley contacted the alumnae and asked them if they would like to come back for a reunion. “They were so lively and active; I was expecting we would get a good group, but I didn’t expect this,” Sister Virginia said. At the time it was founded as St. Peter’s Business School the archdiocesan high school system was in its infancy; there were only Roman Catholic High School for Boys, founded in 1890, and John W. Hallahan High School for Girls, which also opened in 1901. Other than that there were the private academies for those who could afford them. There were several small parish high schools, most notably St. Matthew in Conshohocken, founded in 1866, and a number of parish “senior schools” that were not four-year high schools but offered further courses beyond grade eight, and more commonly parish-based business or commercial schools. 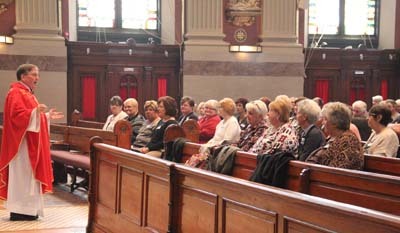 In the beginning many of the parish business schools were co-ed but eventually became girls-only because their training prepared their graduates for secretarial work, which was no longer considered a male occupation. Some schools offered a three-year course but more typically it was two years, as did Bishop Neumann for most of its history. Typically these schools were relatively small because of their focus on a single field, but as the graduates testified, they certainly filled a needed niche in education. “I studied typing, business math, English, religion and everything connected with business,” said Barbara Nowakowski Keyser, who graduated from Bishop Neumann Business School in 1958. Although the girls would graduate after what would be sophomore year in high school, obtaining a position was usually easy because local businesses would contact the school seeking graduates. “I went to work in a carpet factory for two years, then I worked for the government and now I work for my brother-in-law,” Keyser said. Unlike the archdiocesan high schools, which were free for most of their existence, Neumann Business School did have a tuition, although relatively small by today’s standards and worth the price for those who chose to attend. Carmella Campolongo, also class of ’58, said she really wanted to pursue a career in secretarial work and when she heard about Bishop Neumann she liked the idea. “I felt this was the best school,” she said. After graduating she worked several jobs, the longest at Temple University and General Electric. “I never had a problem finding a job because we were trained very well,” she said. When 1949 graduate Anna McGettigan Nazarian attended, the school was still known as St. Peter’s. As was the case all through its history the business school was taught by the School Sisters of Notre Dame, the congregation that taught in the parish grade school. Mary McGettigan Lee, who graduated a year earlier, went to work for Bell Telephone. “You can’t beat the education,” she said. Which begs the question, if by the testimony of the graduates the school was so good, why did the parish-based business schools close, with Bishop Neumann Business school one of the last if not the very last to survive? “Philadelphia’s Finest: A History of Education in the Catholic Archdiocese 1692-1970,” written by Thomas Donaghy, F.S.C., in 1972 suggests several reasons — more archdiocesan high schools opening up with commercial tracks, societal changes that dictated a full high school education as a preferred minimum requirement by employers as well as a reluctance by employers to hire 16-year-olds, the typical age of parish business school grads. But in their day, St. Peter/Bishop Neumann Business School and its sister parish commercial schools did exactly what they were intended to do, and apparently did it very well. Please contact me if there is another Bishop Neumann Business School reunion. I was graduated in 1960 and now preside in Arizona. Thank you and many blessings in 2018.